Built right into the ancient Byzantine city wall, Naz Wooden House is a small attractive hotel in the heart of an old Istanbul neighborhood only a short walk from the Hippodrome and Sultanahmet (Blue) Mosque. Rooms have private bath, air-conditioning, cable TV, Wifi, hair-dryer and minibar. Excellent accommodation in the heart of the city. Staff are super responsive and helpful. The room was great- clean, and with all the details to hace a restful stay. Highly recommended. This hotel definitely deserves a 11 out of 10! Their good review and high rating is indeed true. First I was welcomed warmly by their staff. Then guided me into my room. The room was more than enough for the price. It has all the things you need, 45 in TV, fridge, room warmer, spacious room, my room was dome with red stone ceiling which i think is great instead of having a conventional 4 sided room. It was clean, neat, all sheets are new. It has cabinet safe. Wifi was fast The next day I checked out and left my bags in the lobby and did some shopping, when I came back, the first thing Mr Hakam asked me is, “do you want some coffee?” Enduring a 6 deg outside temperature, u definitely need a warm drink. Thank you Hakam for that! Ull be treated not as a customer but part of their family. They will advise you and warn you about usual city scam, or pickpocketing. The free breakfast was also good, they have a baby seat in case u need one. Overall, if someone will ask, I will definitely book to this hotel again. If u read this post, dont bother look for some other else. Just book it before someone else take it. The landlord was the best gentleman I'd ever met in Istanbul, and his hotel was in a good location, 2-3 minutes' walk to the Blue Mosque, Sofia Church, underwater Palace. The hotel is fully equipped with a separate heated bathroom and a safe. Complimentary breakfast, Wi-Fi, coffee, tea and water. Because my schedule changed. Need to stay for another day, check in at noon waiting to clean the room, the boss also prepared a free lunch. great I'll come back to Istanbul to thank the gentleman's landlord. I'm very happy. Mr. Hakan is the most kind-hearted, friendliest, and downright genuine soul you’ll ever meet in the normally cutthroat tourist trap area of Sultanahmet. We only stayed for a night, and regretted not staying much longer, as Mr Hakan’s enchanting tips and tales got us hooked to Turkish culture and tradition, so much that we’re now mulling to return in the less busier tourist season. Property-wise, the rooms are spacious, charming, and well-maintained...including a historic Byzantine wall that the premise is built around. All in all, this was far beyond a pleasant surprise. Enough browsing, folks, book this hotel right now for the best Sultanahmet, no, best Istanbul, heck, perhaps the best Turkish experience you'll ever encounter! Me and my cousin stayed at the hotel for 3 nights and would totally recommend the hotel, as it is in a very good location, close to the shops and the touristic venues such as Blue Mosque, Hagia Sophia and also really close to the tram station. The rooms have got a view of the Blue mosque and were very clean and the staff were always willing to help and also very kind. Would totally recommend this hotel for everyone. Would like to say Thank you to all the staff for everything. We were very happy with our choice if Naz Wooden House. Not only is the location convenient (close to the Hagia Sophia and Blue Mosque, as well as a tram stop that can quickly get you almost anywhere in the city), but also the host was extremely welcoming and helpful, room and bathroom impeccably clean, bed one of the best we've slept in in our many travels, and breakfast great! 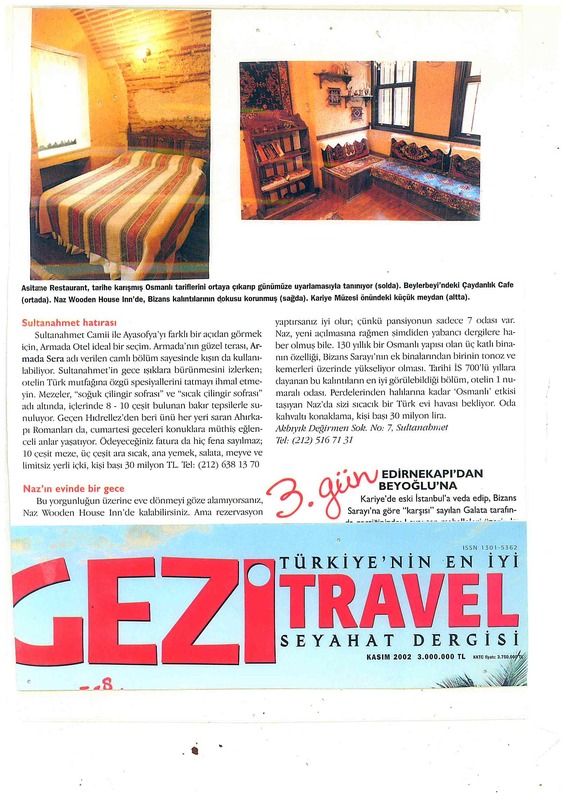 In other words, this was a marvelous place to stay and we intend to stay here again on our next trip to Istanbul! You can book most preferred Istanbul tours, Turkish Hammam, Belly Dancing Shows and Dervish Show tours in advance. We may also help you for tours and transportation services for your travel in Turkey. We meet you at your arrival spot in Istanbul and transfer you directly to our hotel with a private car. Our rate is reasonable, but service is more than you may expect. We can meet you at Istanbul Airport, Sabiha G. Airport, Cruise Port, Train Station or Bus Station. We are a part of a travel group owing also Sultan's Inn Hotel, Naz Wooden House Inn, Istanbul Efendi Apartment, Efendi Travel Agency. Each member of our team will do their best to provide the ultimate stay experience in Istanbul.